What's it like to own a GSD? German Shepherds make wonderful family pets but it is important to remember that this is a working breed and that they do have certain characteristics that can make them more difficult than your average Retriever, Labrador or Collie. The German Shepherd should be well socialised from an early age and needs plenty of exposure to people and other dogs so that they do not develop aggressive tendencies as they mature. These dogs positively thrive on challenging activities and they are so willing to serve their master and please. As youngsters they can be very boisterous and can easily knock over children or elderly relatives, especially if you do not discourage the dog from jumping up when excited. A bored GSD can be very destructive and if left alone will trash your house and contents with ease using their big teeth and claws. These dogs don't really mature until they are about 3 years old so you are in for the long haul to get through the puppy and difficult teenager stage. They are naturally protective and territorial which is something to bear in mind if you have lots of visitors to your house when careful introduction may be required to assure your pet that the visitor is not a threat to his family. German Shepherds invariably hate postmen and window cleaners so you will have to put him out the way if you are expecting either of these to call. This is also a breed that requires a lot of time, stimulation, training and exercise - you will never wear them out, they will always be ready for more. If you are a couch potato a GSD is not for you. Get a GSD and get yourself a good pair of walking or running shoes and find some nice big open spaces to exercise your dog - forests are ideal. Be warned that they tend to like water especially the filthy muddy stuff which sticks beautifully to their nice dense waterproof coat. They never shake the muck off outside but will wait until they get back into the house and take the opportunity to create some nice splatter patterns on your walls or nice clean curtains whilst also leaving muddy paw prints across your pale shag pile carpet. They never miss an opportunity to have a good bark and can be very vocal which may be a problem with your neighbours. They also shed hair in copious amounts and although they only moult once a year, unfortunately it lasts for 365 days so your vacuum cleaner will work overtime and it's unlikely that your clothes and furnishings will ever be free of dog hairs again as well as what you are eating/drinking invariably being contaminated with stray hairs. Invite guests to eat at your place and you can guarantee that they will find hairs in their soup as well as hairs stuck to their smart black trousers. Training your GSD is very important and joining a good dog training club will not only be good for your dog, it will be good for you too. The earlier you start training and socialisation the better as GSD's often develop a tendency to be aggressive towards other dogs, strangers and they can become very protective towards their owners and the property. 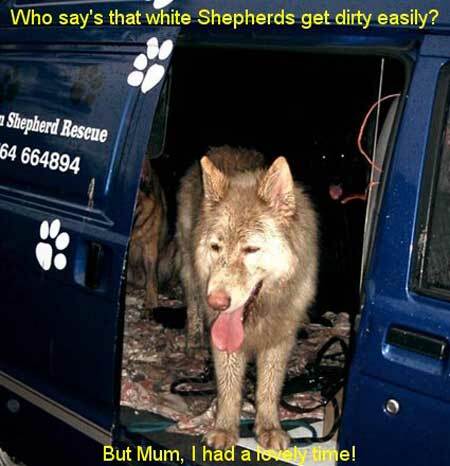 The biggest problem with the German Shepherd Dog is the fact that to a large extent the breed is being spoilt by irresponsible breeding by inexperienced back street breeders who care nothing about preserving the breed but only about making money from the selling of puppies. Health and temperament problems are all too common, so it is important to take expert advice and try and find a reputable source if you are contemplating buying a puppy. Remember though that puppies are hard work and if you haven't any experience with the breed, you may be biting off more than you can chew. Consider first taking on a rescue German Shepherd Dog from a reputable rescue that should be able to give you a good assessment of a particular dog. Remember too that an older GSD will be a very rewarding addition to the family and will be housetrained, won't chew, will be well behaved, probably require less exercise than a young dog and will be very loyal and grateful. The German Shepherd Dog truly is a wonderful animal but if you haven't had one before please do some research first and talk to people who know the breed well. A word of warning though. Once you have had a GSD you will be well and truly hooked! Can you help us by making a donation? Please click on the link below.